Hello! My hobbies vary widely from crocheting and knitting to scrapbooking and sewing. Here I plan to share my current and ongoing projects with you and maybe point out some neat sites and products for you to enjoy. After making zucchini bread for the National Scrapbooking Day scrap last weekend, I had a lot of leftover grated veggie. So I made zucchini fritters! This is actually a recipe called squash fritters, which I use summer or crook neck squash to make. Zucchini, of course, is a type of squash, so works perfectly in this recipe, too. 2. Pat out into patties or spoon and drop into oil in frying pan at medium heat. 3. Cook until brown on each side and serve. Chris loves when I make this. We prefer to eat squashes sauteed or steamed, but if we've got some in the freezer or canned, I make this. We eat 'em with ketchup. I will be trying these this weekend, they look awesome! I retain rights to all content. Please do not use any photos or text without permission. I'm also an Amazon Associate and will recommend products on this blog from time to time. Amazon pays a commission to associate's whose recommendations generate sales. 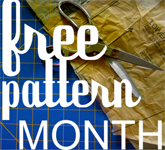 Grosgrain's Free Pattern Month starts Monday!